Apple Pay is launching or gaining expanded functionality at transit systems in additional cities throughout 2019, starting with Singapore today followed by Chicago, Portland, and New York City later this year. Apple Pay is now accepted on all forms of public transit that accept Mastercard credit and debit cards in Singapore, including buses and trains, enabling convenient tap-to-pay functionality with an iPhone or Apple Watch. Singapore’s transit agency expects to add support for Visa cards in the second half of 2019. Chicago’s and Portland’s transit systems already accept Apple Pay, but CTA and TriMet riders will be able to add their preloaded Ventra and Hop fare cards to the Wallet app later this year and take advantage of pre-tax commuter benefits, according to the Chicago Tribune and the Willamette Week. The payment process is similar to using Apple Pay in stores. Depending on the iPhone, that means double-pressing the home button or side button, authenticating with Touch IDor Face ID, and holding the iPhone near the card reader. Apple Watch payments are also activated by double-pressing the side button. The blog Ata Distance suggests that Ventra and Hop cards will support Express Transit, meaning that riders won’t need to authenticate with Face ID, Touch ID, or a passcode, and won’t need to wake or unlock their device, to pay. Express Transit is currently limited to transit systems in China and Japan. 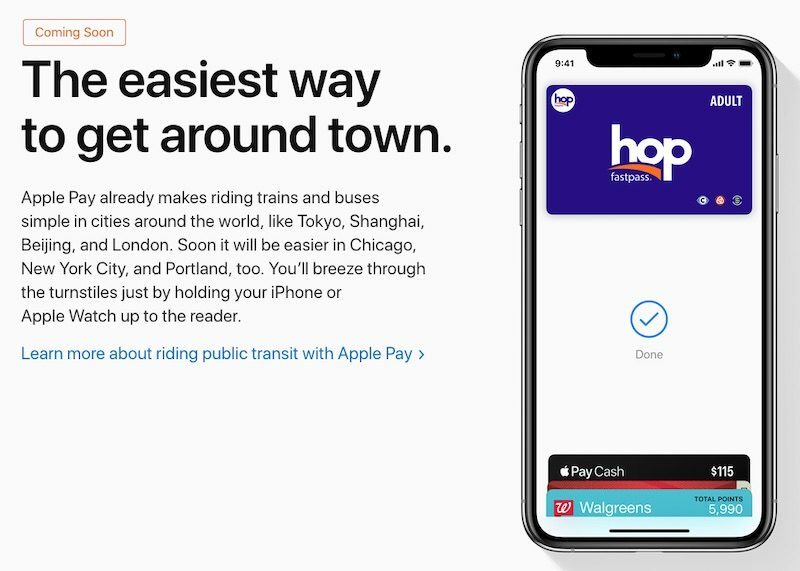 Singapore and New York City would join a handful of cities with transit systems that already support Apple Pay, including Chicago and Portland as mentioned, Beijing, Shanghai, London, Tokyo, Moscow, and Vancouver, Canada.